Today the six-year-old told her sister to feel her armpit. She was sweaty and wanted to prove it. I looked over at the three-year-old. She seemed unfazed by the fact that she had just been coerced into putting her fingers into a sweaty armpit that was not her own. I waffled between giving yet another speech about body autonomy and consent and just shaking my exhausted nanny head and letting it go. I bit hard into my lip and vowed to the heavens that I will not have children. I pictured the poor imaginary offspring I would raise and they were terrorizing the imaginary walls and running into the imaginary street. I shook my head. No. Nope. Nada. Every day that I spend with these cherub monsters I learn more about the world around me and more about myself. Mostly I learn that I can do hard things. Like hold onto my temper and steady my voice when it would be easier to yell. I learn how to let go of the truth, because it really isn’t worth arguing with a six-year-old dictator. I learn that I have a pretty good head on my shoulders. I can talk about hard topics like racism and violence and consent in completely age-appropriate terms. Like that time we drew life-sized leprechauns on big rolls of paper and the six-year-old demanded to know why my leprechaun was colored in with brown crayon and why on earth it was a woman. “But you are doing it wrong. There are no girl leprechauns and they aren’t brown!” the six-year-old protested. “Who says we can’t change that?” I asked. Side note: this is a really good way to exasperate a six-year-old control freak. “I am a girl. And I think it is only fair that I get to choose to draw my leprechaun as a girl,” I announced. We talked about people with brown skin and tan skin and pink skin. We took out my phone and looked at pictures of historic figures and athletes and celebrities and the First Family. This apparently worked because I did not get further harassment for my artistic deviance. Here is what I am discovering: I am living out my awakening everywhere I go. 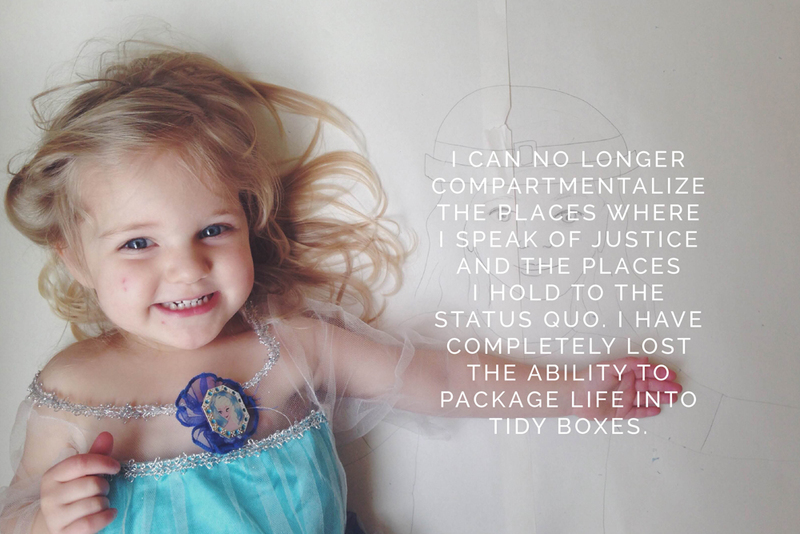 I can no longer compartmentalize the places where I speak of justice and the places I hold to the status quo. I have completely lost the ability to package life into tidy boxes. That means the little girls I watch go to the ballot box with me to vote and I show them photos of the strong black woman with the big natural hair I want to be our next Superintendent of Schools. It means I teach them silly phrases in Spanish and explain how useful a second language can be for making others feel included. And when I braid their hair, I do not compare their golden locks to princess, but instead to Senators and soccer stars and firefighters (like their dad) and surgeons and farmers. And of course I give many many many lectures on consent and body autonomy. I have completely left the camp of “ordinary” and I do not know the way back. I am learning to be okay with this. In the meantime, I mumble swear words and prayers for mercy.